I was told only post or display my best work, but I am posting this one because I think it is a teachable moment. It is not one of my best pieces of artwork. In this painting is a thousand things I could of have done differently and thousand things I need to do, but that is not what’s important. What is important is what I learned, pretty much my complacency. I don’t pretend I’m the greatest artist, really I’m just an infant in the world of art, but it is something I truly love and enjoy. Most of my paintings come from my husband’s pictures or other photographs I find on line. 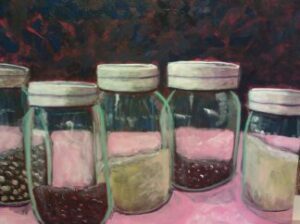 My art teacher, Polly Jackson, decided to give us a new experience of drawing from life, she put these glass jars on the table and we were to draw from “real life.” I immediately hated everything about painting these jars. I was so uncomfortable that I sat and plotted on my phone about sending a surprise gift for Christmas with some friends of mine. It got to the point that Polly asked if I was going to paint today. I so was agitated because I didn’t know what I wanted for the foreground, the background, I was having a difficult time with proportion, painting the jars, and I was frustrated. My inflated artist self was cracking at the edges. I was being forced to see again. I had become so complacent by using photographs that I forgot the subtle nuances of highlights, shadows around the edges, and the curves of the glass. My lesson in the agitation, that uncomfortableness is where I learned the most about seeing, drawing, and where I was taught that I have so much more to learn, where I learned to reach past the uncomfortable and forsake complacency and begin again. Most likely, I will cover this painting over with gesso and begin anew with something else, probably something else that really annoys me, I will probably even with the new picture avoid it like the plague, plot some other surprises, chit chat with other artists around me until I get the looks of “please leave me alone”, but I look forward to see if I can dig further and break the edges of ego and become a child again fascinated by art.